I don't normally spend very much money on cosmetics, but.... I caved. I got lucky and was able to purchase all these products for great package deal at the makeup event at Nordstrom. To be honest, it was such a great decision! I am so pleased with these products! I would definitely recommend them. They are incredible for contouring/highlighting. The blush is just the right color, not too pink and helps to achieve a beautiful healthy glow. Best blush Ive ever used. The lip gloss is a pretty pink color and IT ISN'T STICKY! I typically refrain from using lip gloss cause they always seem to be so sticky and I finally found one that isn't! 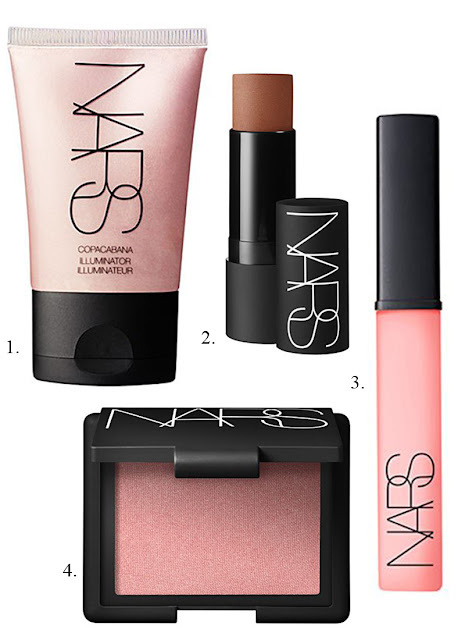 If you are looking for good contouring/highlighting products, an awesome blush and pretty lip gloss and are willing to splurge just a bit (in my opinion it's a bit of a splurge) I definitely recommend these products from Nars Cosmetics!